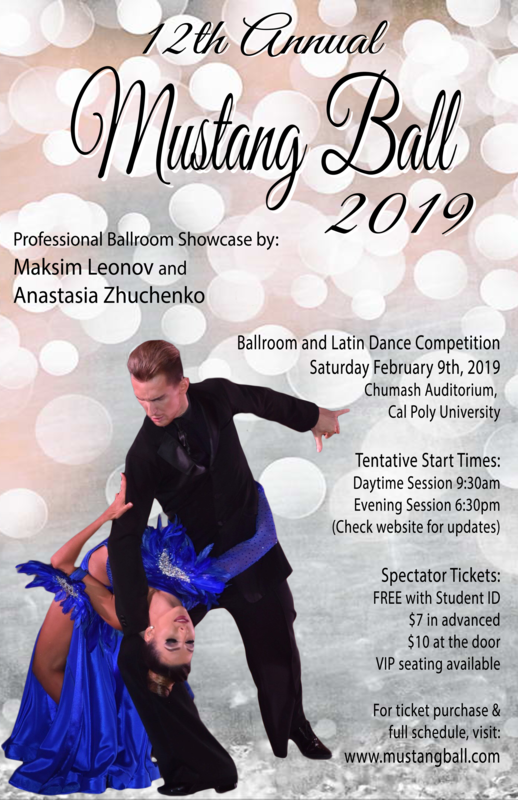 The Cal Poly Ballroom Team is pleased to announce the 12th annual Mustang Ball on Saturday, February 9th 2019! This Ballroom & Latin dance competition will feature competitive events in International Standard and Latin, American Smooth and Rhythm, and Nightclub dances (including Salsa, Hustle, West Coast Swing, Argentine Tango, Lindy Hop, Blues, Night Club 2-step, Bachata, and Merengue). There will also be a formation team competition, performances, a team match, and other fun events throughout the day. Attend as a spectator to watch some great dancing or sign up to compete in one of our many competitive events. If you have never competed before, we will have a newcomer level especially for first time competitors! We will be posting updates about the competition to our Facebook event, so be sure to join!